Events surrounding the CMA Music Festival are already going strong. Yesterday brought the CMA Global Artist Party and the City of Hope Celebrity Softball Tournament. Today’s (6/8) events include the AristoMedia Global Showcase and Chely Wright’s Reading, Writing & Rhythm Benefit Concert with Trisha Yearwood and more. Eight Country music artists from around the world gathered in downtown Nashville Monday night, June 7, to help kick off CMA Music Fest week at the CMA Global Artist Party. Monday night’s showcase, held at The Stage on Broadway, featured artists Luke Austen (Australia), Jaydee Bixby (Canada), David Bradley (UK), Sinead Burgess (Australia), Cameron Clayton (New Zealand), Tim McKay (UK), One More Girl (Canada) and Alex J. Robinson (Canada). The evening’s events were hosted by Adam Gregory, who also played a set for the packed house. Today at 3:30 PM at The Second Fiddle, Australian duo O’Shea hosts the AristoMedia Global Showcase, sponsored by the AristoMedia Group, CMA, Digital Rodeo, and Four Seasons Coach Leasing. Artists participating include Travis Collins (Australia), Emma King & The Heartsets (UK), the European Highwaymen (Norway), Jessie Farrell (Canada), Jo Hikk (Canada), Steven Lee Olsen (Canada), and Ronnie Rae Rivers (Australia). Monday's CMA Global Artist Party. Pictured l to r: Chip Huffman (Four Seasons Coach Leasing), Britt McKillip (One More Girl – Canada), Steve Moore (CMA), Carly McKillip (One More Girl – Canada), Cameron Clayton (New Zealand), Alex J. Robinson (Canada), David Bradley (UK), Adam Gregory (Canada), Jeff Walker (AristoMedia), Mark Moffatt (CMA Global Artist Party producer), Tim McKay (UK), Jaydee Bixby (Canada), Sinead Burgess (Australia), Luke Austen (Australia). Chevy, "The Official Ride of Country Music," and a committed Music Festival sponsor, hosted a music industry "Ride and Drive" at the CMA offices last week. Participants had the opportunity to test drive their choice of several vehicles. Chevy donated $25 for each test drive to The Community Foundation of Middle Tennessee for flood relief. 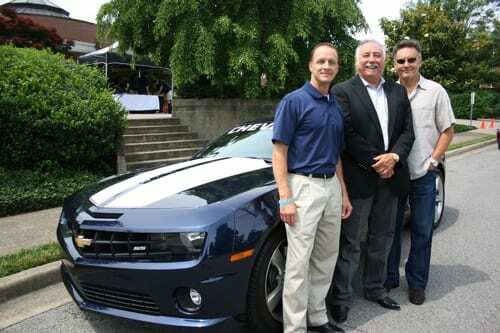 Pictured (left to right): Phil Caruso, Chevrolet National Sales Promotion Manager; Steve Moore, CMA Chairman of the Board; and CMA Board member Randy Goodman. Kid Rock will perform during the Nightly Concerts at LP Field on Friday, June 11. On Wednesday, “The Sixth Annual CMA Music Festival Kick-Off Parade” starts at 11:30 AM. Immediately following the parade, “The Fifth Annual CMA Block Party” will take place on the Chevy Music Stage on the Bridgestone Arena Plaza (at the corner of Fifth Avenue and Broadway). CMA Music Festival and the Nashville Convention & Visitors Bureau have partnered to present the Music City Zone. Located at the Public Square Park at the top of Second Avenue, the Music City Zone will have free daytime performances showcasing an eclectic array of musical styles on the GAC Stage. Open Friday, June 11 from Noon-5:30 PM/CT; Saturday, June 12 from 10:00 AM-6:00 PM; and Sunday, June 13 from Noon-5:30 PM. Society of Leaders in Development (SOLID) will donate a portion its Yard Sale proceeds to the MusiCares Nashville Flood Relief Fund. SOLID’s 8th Annual Yard Sale will take place Saturday, June 12 at the Bridgestone Arena. The Grand Ole Opry has plenty to offer fans this week, including tonight’s Tuesday night Opry at 7 p.m. with a performance at Municipal Auditorium in downtown Nashville. Among those scheduled are The Band Perry, Jimmy Dickens, Josh Turner, Carrie Underwood, and Trisha Yearwood. The Country Music Hall of Fame And Museum has tons of autograph signings and more to bring in festival-goers.